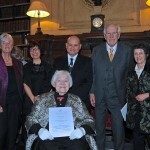 The Balfour of Burleigh Tercentenary Prizes for Exceptional Achievement in Crafts are named in honour of Lord Balfour of Burleigh who retired as a Trustee in 2014 after 40 years’ distinguished service to the Radcliffe Trust. Through these prizes the Radcliffe Trust is celebrating the achievements of the many extraordinary organisations and individuals it has supported over the years. The Textile Conservation Foundation proposed Karen for the award as her achievement, in founding the TCC, was most certainly exceptional. In the 1960s Karen became dissatisfied with conservation techniques of the day, so investigated new and minimally interventive approaches. Many were keen to learn the new techniques and were taught by Karen at her home in Ealing. In 1975, with the support of very many people, Karen established the Textile Conservation Centre at Hampton Court Palace. Karen’s insistence on the meaning of textiles as culturally significant objects permeated her approach to conservation and teaching, turning the simple act of looking at a textile into a voyage of discovery – based primarily on her own craft background and her understanding of the importance of the object. She made links with many other disciplines and, untypically, ensured science was integral to the textile conservation programme from the beginning. She created a tradition, which enabled conservation to develop on a conceptual and practical basis, taking the authenticated object as a basis for the development of knowledge, understanding and enjoyment. Karen faced many challenges but, with her vision and determination, overcame them all to establish the world’s first programme in textile conservation and, in so doing, creating the modern specialism of textile conservation. She is rightly credited with being a key figure internationally in the field and, as a result of her own work and that of her successors at the TCC, and its successor the Centre for Textile Conservation at the University of Glasgow, many hundreds of textile conservators have been given appropriate and rigorous training and now work in over 30 countries. 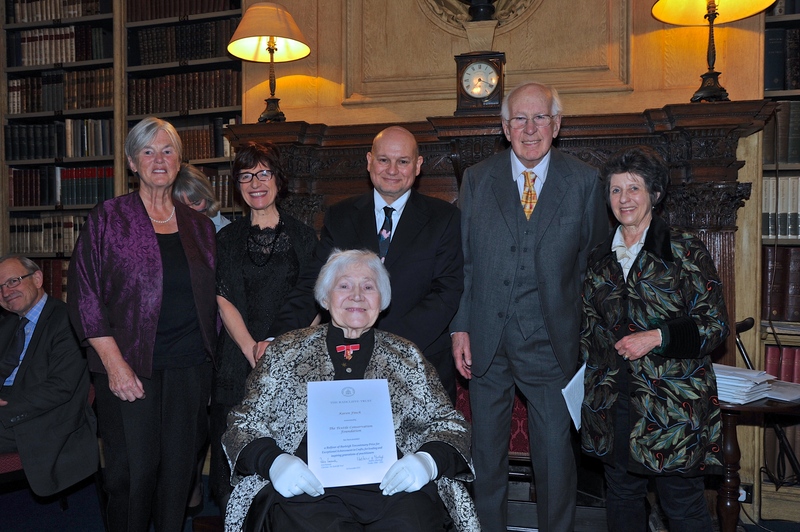 Karen receiving her prize with (from right to left) Lady and Lord Balfour of Burleigh, Alan Cohen and Katrina Finch Cohen (Karen’s daughter and son-in-law) and Clare Meredith (Chair of the TCF).